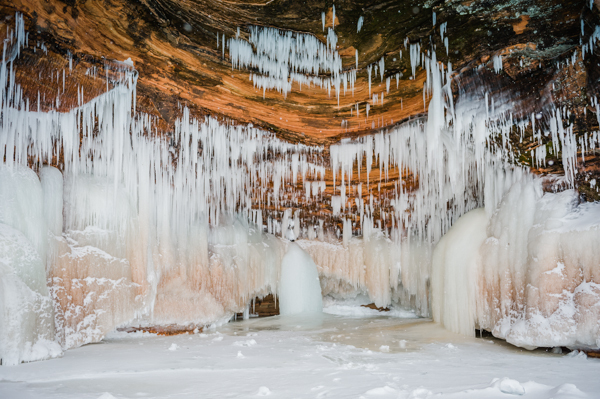 It’s been a frigid winter in Northern Wisconsin, and for the first time in years the deep freeze has solidified Lake Superior enough for visitors to reach caves in the Apostle Islands. 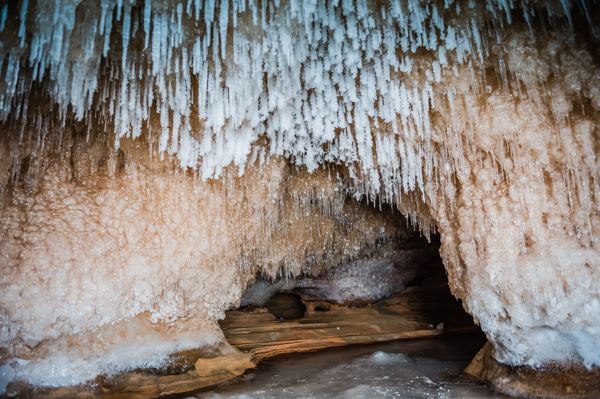 Since the National Park Service opened the caves, thousands of people have visited the natural attraction. 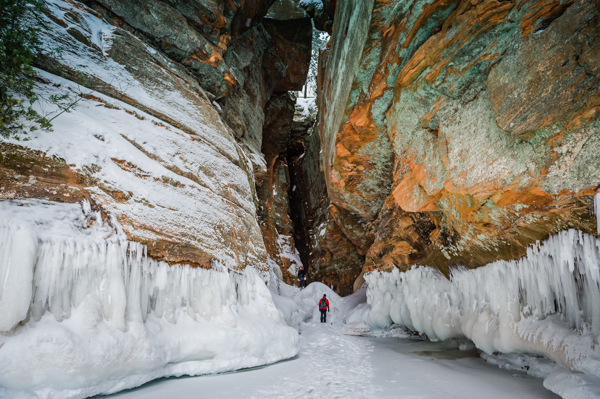 Hiking to the caves is a two-mile roundtrip journey across the ice. 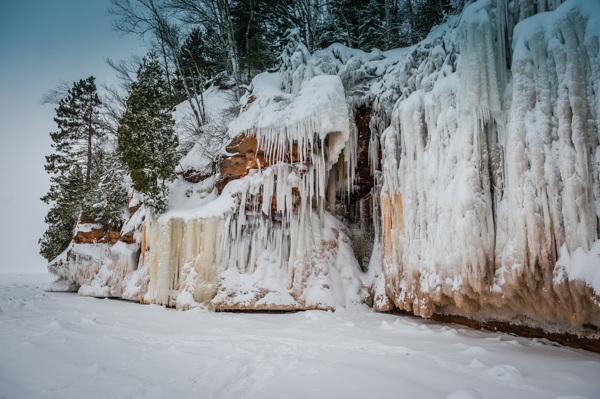 The Apostle Islands National Lakeshore staff reports that travel on Lake Superior ice requires extra attention to personal safety. 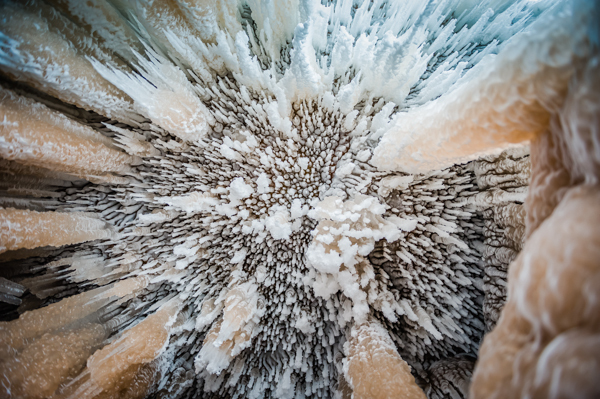 While they do check the ice regularly, conditions can change quickly. 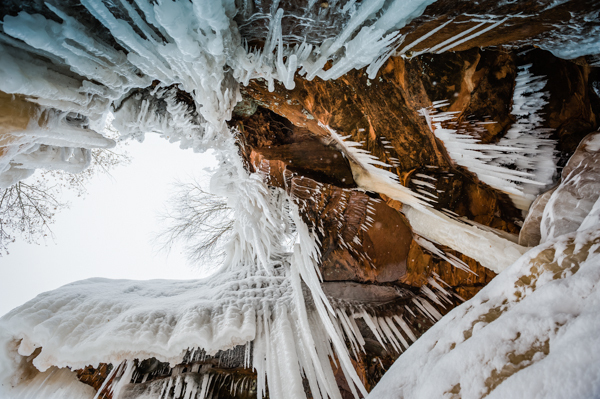 For those who would like to visit the caves, the NPS “Ice Line” phone number will have the most current information and can be reached at (715) 779-3397 extension 3. Wrote Dougherty: Jack leaves tomorrow — back to Madison to complete the second half of his freshman year. 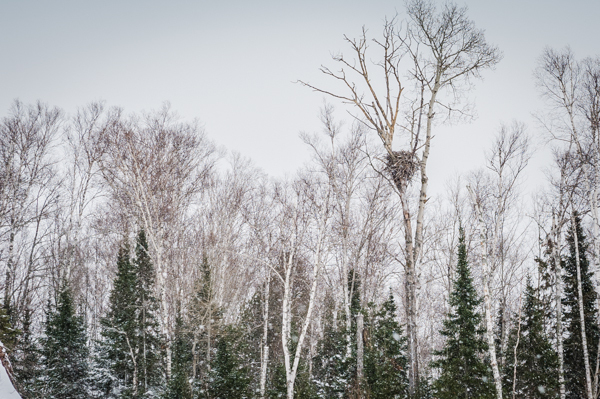 I wanted to do something epic to recognize his leave-taking; some collection of experiences he can bring to Madison, package away in his dorm room and pull out when he needs to remember why Lake Superior will always be home. 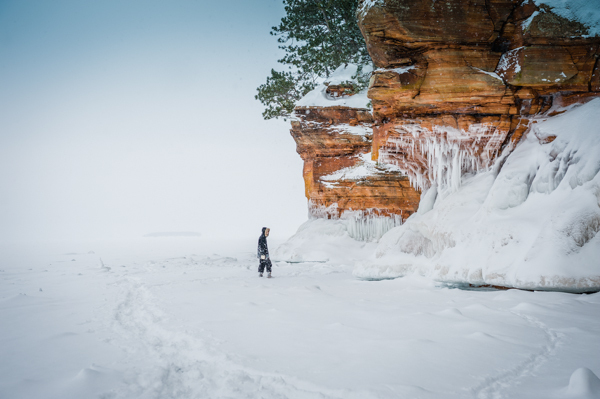 A morning walk to the sea caves in a foot of fresh powder and more falling from the sky was, quite possibly, the most epic adventure we’ve had since Jack came home. 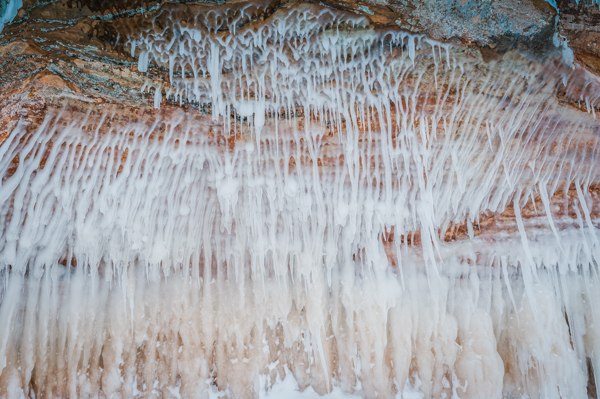 The sea caves have been inaccessible since 2009, and while I’ve been out to them twice in the past (in the company of 75 – 100 other travelers), this was the first time we’ve traveled the mile or so alone. 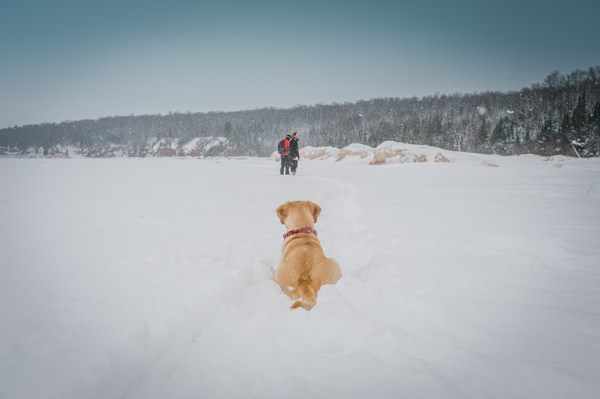 The walk was a mixture of apprehension (how do I know if the ice is thick enough), wonder (the snow, wind and ice enveloped my eyes and ears), and excitement (Ted, Jack and I were alone, walking across a frozen lake toward one of the wonders in this world). There was a single track along the shore and out across the lake. 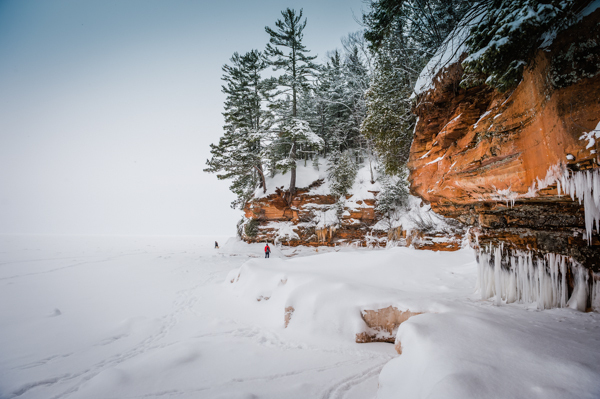 The snow was a pristine white blanket, it was quiet enough to hear the ice creak and pop with unseen swells from the lake and it was solitary enough to feel the ancient energy radiating from the rocks that ringed the shore. 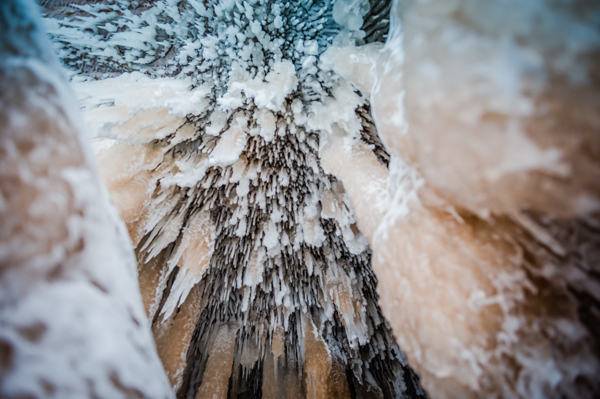 Words can’t begin to describe what it felt like to witness the wild and ephemeral beauty of ice and sandstone. 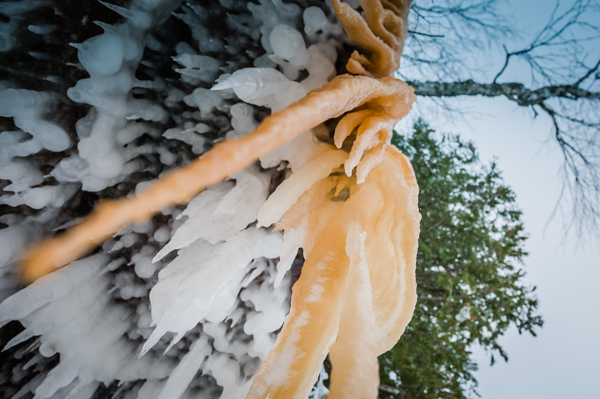 The different colors, shapes and textures of the ice was mind-blowing. 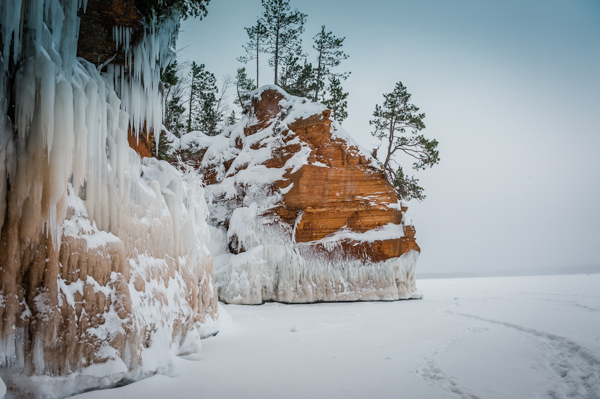 It was a work of art, created by wind and water — magical in its perfection. The silence was remarkable. 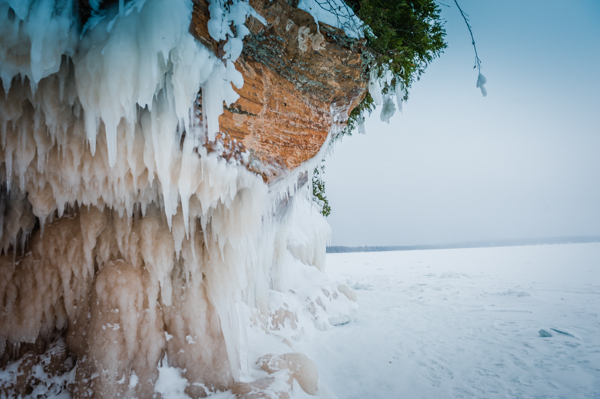 I’ve spent hours on the lake and there’s always noise — seagulls, waves, wind, voices carried across the water… but today was the kind of muffled quiet that accompanies a snowfall. Perfect for a photo safari with two of my favorite men. 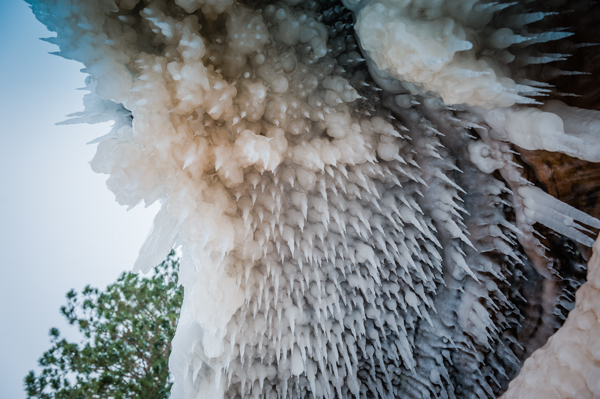 Each ice formation was different but equally majestic. 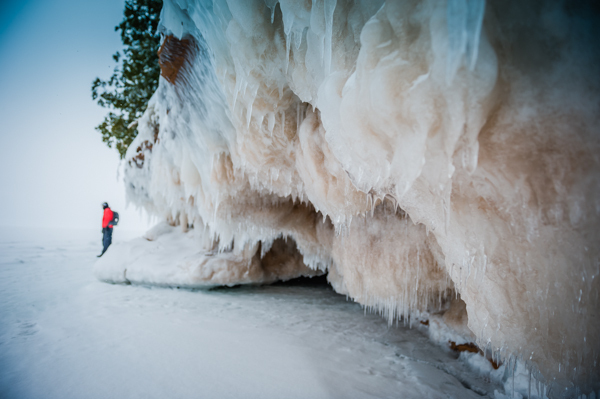 Sharing the experience of sacred wisdom, imagined in ice and stone, with Jack and Ted was more than I hoped for when we set out in the morning. I know Jack carries that wisdom in his spirit and a morning spent deepening his connection to this mystical place will serve him well as he moves into the world. 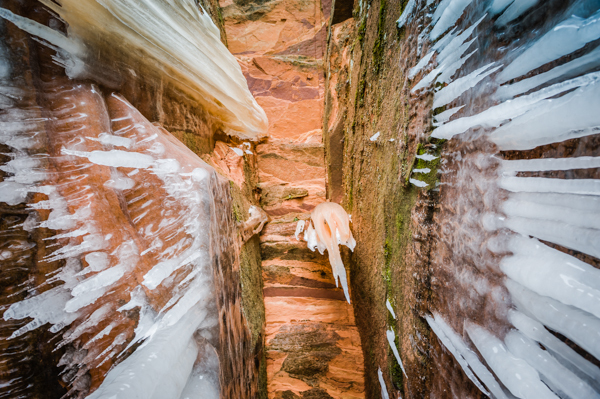 The lateral lines and warm colors of the sandstone were a stunning contrast to the stark white, vertical ice formations. 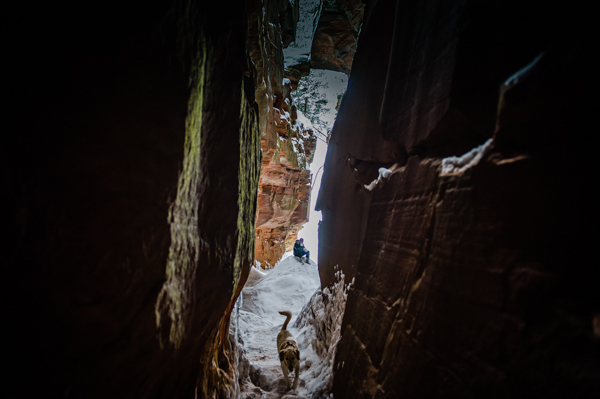 Deep in this cave, I found a bit of greenery— frozen in its climb towards the light. The last cave reminded me of a cathedral. 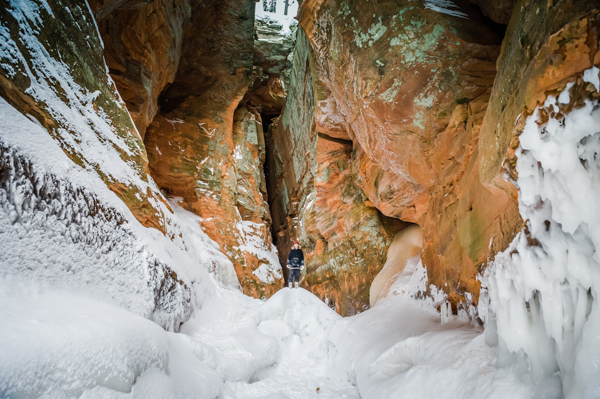 The sandstone cliffs soared straight up and the path through the crevasse led me about 150 feet back to the sound of running water. 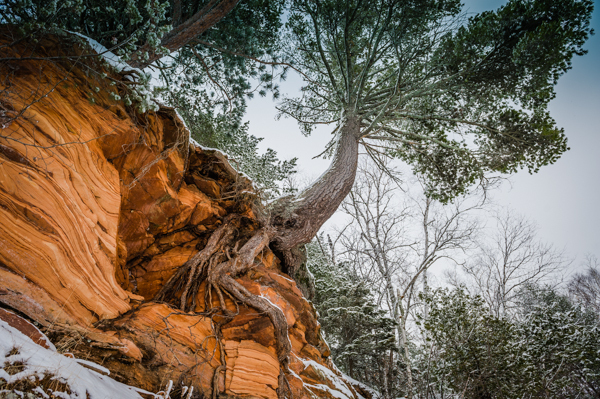 As I stopped and listened to the water deep in the belly of a sandstone cliff, I said a fervent prayer of gratitude. Grateful for a spirit that recognizes the divine in the sound of running water, for the unending blessings I’ve received over the course of my life, for the wisdom of wild places, for our children with open hearts and a sense of wonder, for a partner who is my ‘ever-fixed mark’ and for sandstone canvases painted with ice on the shores of my favorite Lake.